This flow meter monitors the flow rate of powder and granulated material without contacting them. Ideal for measuring the flow rate of insulating powder and granulated material, and powder with a somewhat low specific gravity. There is almost no measurement error due to temperature or pressure variations. The latest technology allows for both a compact form and a high sensitivity. 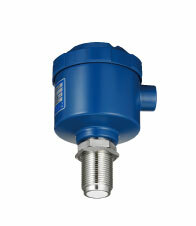 Since this is a non-contact type sensor, it does not interfere with the flow of powder or granulated material in pipes. Employs the latest technology allowing these units to provide high sensitivity, high precision, and remain compact. Since this is a non-contact type sensor, and the electrode does not protrude into the pipe, it does not interfere with the flow of powder or granulated material. It is unaffected by dirt or other material stuck to the sensor. Very strong microwaves permeate through dirt and material stuck to the oscillator surface, so they cannot cause faulty detection. * The video demonstrates actual measurements made using this sensor. 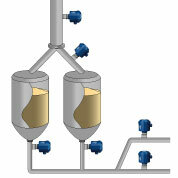 *Monitor the flow rate of powder and granulated material in a transporting pipe or a silo. *Can monitor the flow of micro-powder and grain. Variable between 1 to 15 sec.